"It turned out that most polling firms underestimated Mr. Obama’s performance, so those that had seemed to be Democratic-leaning results were often closest to the final outcome. Conversely, polls that were Republican-leaning relative to the consensus did especially poorly." I know I keep patting myself on the back over this, but some of the names I was called for simply stating that Rasmussen was a poorly run poll were something else. It makes one tempted to spike the football. After completely botching two elections in a row, do you think Rasmussem will get any less love from Republicans in 2014? When Rasmussen shows up about 15 months from now, consistently producing polls that are 3-5 points friendlier to Republicans, you'll have the usual crowd here screaming that all the other polls and wrong and that Rasmussen is right! Rasmussen was pretty good until they scrubbed their model after 2008. My guess is Scott Rasmussen will pay someone to rejigger it to make it more in line with actual voter trends. I doubt it. 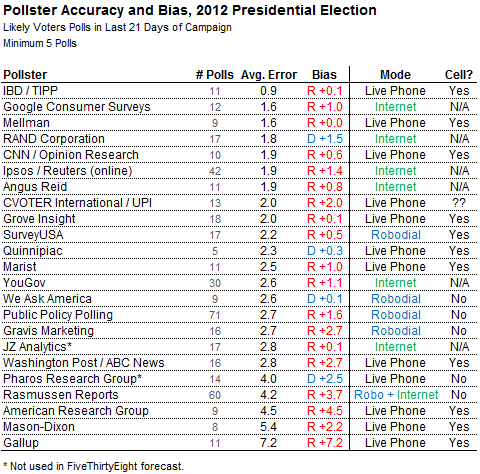 SR traded Fox Tv appearences for polling integrity. Gallup's rep might take a serious hit after this last election. Nate Silver was dead on and guess EXACTLY which states Obama and Romney would win. People thought his predictions were ridiculous. A lot of people are eating crow. I now feel entirely justified in having quoted Nate Silver saying that this election was "Gallup vs The World".